Safety is always your first priority in the workplace. Whether you work in a warehouse, factory or mining site, the wellbeing of your employees always comes first. While training, awareness and common sense are critical to safety, there are a number of safety products available on the market that will go a long way to preventing injuries in the workplace. 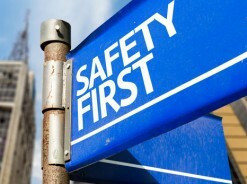 Many employees often overlook/forget about these basic products, resulting in unnecessary injuries and sometimes death. A very simple but often overlooked basic safety essential. Your entire warehouse or factory needs to contain clear signs that are visible from anywhere and easy to understand. From clearly labelled exit signs with arrows, to emergency exits, warning signs and the position of fire extinguishers and first aid kits. When a worker looks for any of these, they should be able to spot one easily. The same goes for signs reminding workers of any safety protocols, this reinforces something the workers already know but reminds them that they have to obey all safety instructions. It also applies to wearing safety equipment in certain situations, and to switch on and off particular equipment at specific times. Once again a very basic piece of equipment that needs to be well positioned all around your work area, easy to spot and easy to use. It’s not enough that there are plenty of these, but at least some, if not most people need to know how to use them. In addition, they must also be regularly tested to ensure they are in good working order. It’s no use having the same fire extinguishers in place for 10 years and when you finally need them they don’t work! Remember, insurance probably won’t cover any fire damage if the proper fire safety mechanisms are not in place, this includes replacing or servicing your extinguishers on a regular basis. When employees have been working at the same job for quite a while, without incident, they often get complacent. They start ignoring compulsory safety rules and not wearing the required safety equipment. This leads to accidents. If you need to wear eye googles, hard hats, safety harnesses, masks, gloves, hard-toe protective shoes, do so, there’s a reason. There are some places in certain sites that only experienced and professional personnel should enter. There might be highly sophisticated and dangerous equipment in these places and you don’t want just anyone entering. As a site manager, you need to make sure these places stay restricted, and that only a select few have access to these areas. A nuclear facility might be one such place. These are essential to any worksite safety, both inside and out. First of all, inside; cameras that keep an electronic eye on your employees can ensure that they are following all safety protocols and that no one is doing anything dangerous. If you have someone monitoring these cameras they can hopefully pick up on safety breaches before they escalate into something more serious. These cameras can often also provide evidence to any accidents that happened, if they have been captured on camera. This could help ascertain the cause of an accident, and help prevent them in the future. The same goes for cameras outside the buildings. The will help prevent security breaches and any trespassers entering your premises and causing damage to your equipment. Working at heights is dangerous, obviously, so use all the necessary equipment. If you are using scaffolding or ropes for access work, you must ensure this equipment is in good working order, every time before using. Also, ensure you have more than one safety mechanism, just in case. While many people work in dangerous situations, by taking good care of yourself, paying attention to all safety protocols and using all the necessary safety mechanisms that you are supposed to, you’ll go a long way to avoiding injury in your work place. When you do buy safety equipment make sure you buy from a reputable dealer, who can advise you correctly and sell you the correct and necessary safety gear.